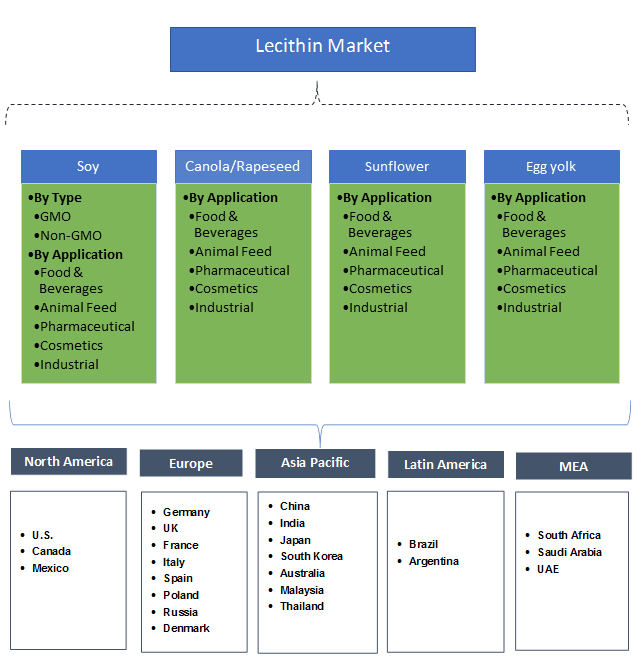 Lecithin Market size was over USD 1.65 billion in 2017 and industry expects consumption at over 530 kilo tons by 2024. Growing concern towards healthy lifestyle and propelling demand for nutrient rich food & beverages and supplements may stimulate the market size. These are composed of phospholipids which are sourced from oilseeds which includes sunflower, rapeseed and soy. The blending property exhibited by this product is driving its demand in the food & beverages, pharmaceuticals and cosmetic industry. Global food & beverage market size was valued at over USD 5 trillion in 2017 where consumers have been focusing towards health consciousness which is likely to accelerate the market size. Moreover, manufacturers are experimenting to create food products for consumers which aids in reducing calorie and sugar intake in without lessening the taste, thereby increasing overall product demand. Also, consumption of bakery products such as pies, brioche and cupcakes including breads and pastries supports vast product range which in turn stimulates the industry growth. Soy lecithin is widely used in poultry feed as it provides necessary amino acids for maximum product efficiency and energy sources. Global animal feed was valued at over USD 17 billion in 2017. Increasing industrial livestock production and technological advancement in the meat processing industry creates demand for high quality meat products thereby driving the poultry feed market which in turn stimulates the industry growth. Increasing R&D efforts by manufacturers to achieve lucrative production and higher product development may foster the global market growth. Government regulations and protocols for phospholipids play a critical role in food application in Europe region may upsurge the product demand. Global phospholipids market may surpass USD 4 billion by the end of forecast period. These are the compounds which are extracted from source like lecithin which includes egg and soy and impart various functional properties in pharmaceutical, nutrition & supplement application, which in turn boost industry growth. Manufacturing process of lecithin is capital intensive along with usage of harmful chemicals such as acetone and hexane in the extraction of soy is likely to hinder the market growth. Sunflower lecithin act as a substitute to soy as these are extracted naturally without addition of any chemicals which makes them desirable in various health applications, thereby driving the industry growth. Soy lecithin market demand was valued at over USD 1.1 billion in 2017. This product is majorly used as emulsifier in various industrial application such as food, animal feed, cosmetics and pharmaceutical. Moreover, these are composed of choline, glycerol, fatty acids, glycolipids and phospholipids these are usually used as a liquid, but can also be purchased as granules, which is likely to facilitate product demand in various countries. GMO soy lecithin market size from pharmaceutical applications may witness significant gains at around 4.5% over the foreseeable timeframe. These products are used in treatment for hypercholesterolemia which reduces cholesterol levels by 18% along with changes in lipid metabolism and improves neurological disorders which results in improving memory, thereby increasing product demand. Sunflower lecithin market demand may register gains close to 6% over the forecast period. It contains numerous phospholipid types and antioxidants, along with their volatile compounds which makes them a healthy supplement. It is a natural emulsifier which aid in reducing the presence of other fats and protect red blood cells, which in turn foster the product demand. 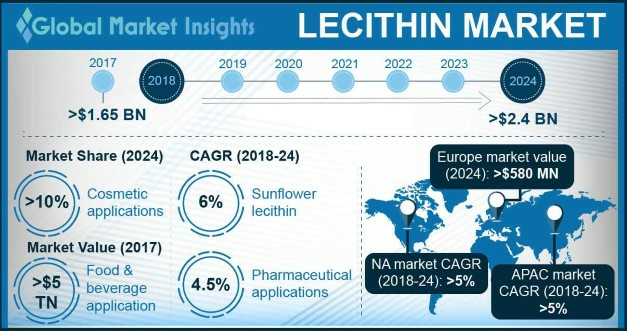 Sunflower lecithin market size from cosmetic applications may surpass USD 35 million by 2024. It is used to produce moisturizing, revitalizing and toning creams, shampoos, conditioners and other products. Surface active properties of this product promotes deeper penetration of these products in the epidermis and holds antioxidants properties making it suitable for the cosmetic application, which shows ample growth potential for the market. North America driven by Mexico, Canada and the U.S. market size may register significant growth at over 5% up to 2024. Growing demand for cosmetic products and increasing disposable income accompanied by skincare and haircare products demand will accelerate the regional industry growth. These products in cosmetics are utilized for skincare as they are emollient which act as a softening and soothing agent for all skin types. The powerful moisturizing properties aid to keep the skin hydrated and makes it an additive for restorative creams. It improves the appearance of the damaged hair and helps in straightening procedures as they avert fly-away hair, are the key attributes favouring regional growth demand. Europe driven by UK, France, Spain and Germany market demand may surpass USD 580 million by 2024. Rising demand for bakery products such as cakes, breads, pastries are the key factor to boost the industry growth. There is an ongoing trend for increased production of sliced and wrapped bread and consumers are more interested in products which takes less time spent on home food preparation and consumption, thereby driving product growth. Asia Pacific led by South Korea, Japan, India and China market is likely to register significant gains at over 5% by 2024. Increasing R&D investments in pharmaceuticals and growing trend towards generic drug manufacturing in the region is likely to boost industry growth. Growing population along with increasing health standards has led to increase in health service spending. Significant development in active pharmaceutical ingredients and medical tourism market for several countries such as Malaysia, Thailand and India may foster the industry growth. Global market share is moderately consolidated with ADM, Cargill, GIIAVA, Haneil Soyatech and SOYA. Companies are engaged in joint ventures and mergers to expand their regional presence and focusing on new product advancement to gain viable advantage which may foster product range. Moreover, other industrial participants are focusing to produce lucrative products to strengthen the global presence. Lecithin are prepared by extracting and purifying phospholipids which are amphiphilic in nature. Increasing consumer demand towards healthy food & beverages, cosmetic, animal feed and pharmaceutical is likely to propel product demand. In pharmaceutical sector, these are used in several formulation like fat emulsions, suspensions and as a drug carrier. Changing food consumption patterns and increased per captia income is likely to drive the packaged and processed food industry growth which offers growth opportunities in the lecithin business market.